Ingleton is famous for its waterfalls, but there are several in the area that aren't as well known - for various reasons: mostly due to difficult access or a remote location, requiring that extra degree of effort to reach. One such example is Easegill Force (SD709728) - not be confused with Easegill above Cowan Bridge. In this hidden glen just off the old road from Clapham to Ingleton, some of the finest river and gorge scenery in the Three Peaks can be found. This was an area much frequented by 19th century writers and explorers ... and no wonder. 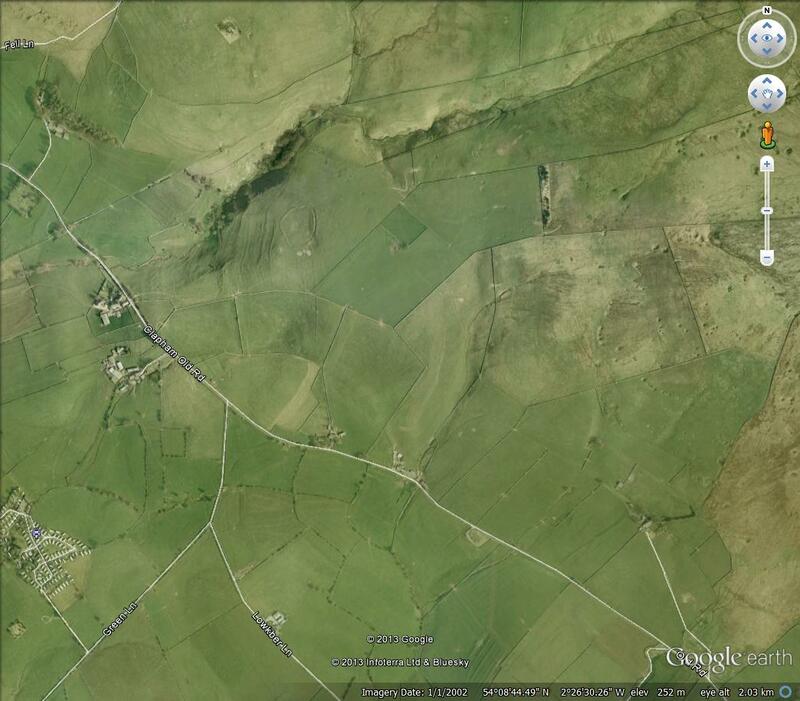 The great fracture known as the North Craven Fault cuts left to right across the fields leading up to the wooded glen of Jenkin Beck, where the waterfall is situated. The underlying rocks in the foreground, on the south side of this fault, have been 'downthrown' about 600 feet from their original position, so that, effectively, the same plane of Great Scar limestone that can be seen on the upper skyline at Crina Bottom, now lies buried far below these fields. A layer of glacial drift (debris left by the ice) now blankets these valley sides. A massive amount of Great Scar limestone has been eroded or 'trimmed' away north of the fault to leave the 'wall' or plateau as a distinct block on the skyline. A combination of uplifting in the area north of the fault, and intense erosion by rivers and ice has, in places, uncovered basement rocks 500 million years old! Entering the glen formed by Jenkin Beck, which has cut deep into the lower reaches of the limestone plateau. An attractive cavern is passed on the right bank of the glen as we head into the depths of the gorge. The glen itself is a luxurious growth of wild garlic, mosses, ivy and ferns - all typical of the limestone dales. Small cascades are numerous and contrast with the rich green foliage. Some cascades have to be seen moving to be fully appreciated. This one is encrusted with mosses. Looking back towards the entrance of the glen, with Jenkin Beck making its way out to the sunshine. Crescent-shaped limestone cliffs such as this show where water has previously cascaded into the glen: most probably meltwater torrents at the end of the last ice age. Excitement mounts as the glen swings at an acute angle to the right, and the cliffs grow in grandeur. First impressions on film, from the encircling cliffs to Easegill Force in all its splendour. Easegill Force sees Jenkin Beck exploiting a weakness in the limestone and gradually enlarging a massive natural arch, still marked on ordnance survey maps. An impressive 'bar' of limestone has been left, spanning the fall; a feature that is unique in the area. Seen from the east side of the glen, the full majesty of this beautiful waterfall can be better appreciated. Witness the spectacle, before we climb the east slope for a view from above. I climbed up the east slope and, with great care, managed to get a stunning view down the fall and under the natural arch - itself a 'rock garden' for a multitude of plants. The delicate cascade, like the tail of a mare, curves gracefully as a ribbon of white water beneath the arch. My final view was from the east side. In dry conditions, enthusiastic explorers can edge their way down onto the 'bar' of rock itself. I let discretion be the better part of valour - and lived to see another adventure! There are no public paths to Easegill Force. Enquire for permission at Fell End Farm (extreme top left) which is just outside Ingleton on the left of the Ingleton to Clapham Old Road. To reach the force, I always take the second gate on the left after Yarlsber, following the wall eastwards immediately from the 'old' in 'Clapham Old Road'. At the junction with the next field and through a gate, turn 90 degrees (north) along the wall towards the obvious tree-lined glen in the photograph, dropping down a steep grassy slope to the lower reaches of Jenkin Beck. After that, it's a slippery scramble up the glen to the force itself. The obvious earthwork to the right of the gorge has never been reliably dated. We will return to explore it on a later adventure.